Along Came Poppy: 366 Books In 366 Days: Funny Birds! 366 Books In 366 Days: Funny Birds! We love a book that makes us giggle and I’ve previously shared some of our favourites. Here are another couple of excellent picture books that have really tickled us recently. It just so happens one features an owl and the other, a seagull, you could say they are a couple of funny birds! We all know owls are wise, but did you know they are also masters of disguise? Well Hoot Owl thinks he is anyway. A totally melodramatic tale of a hungry owl searching for his dinner. But what will he catch? A rabbit, a lamb, a pigeon? Or maybe even a pizza? 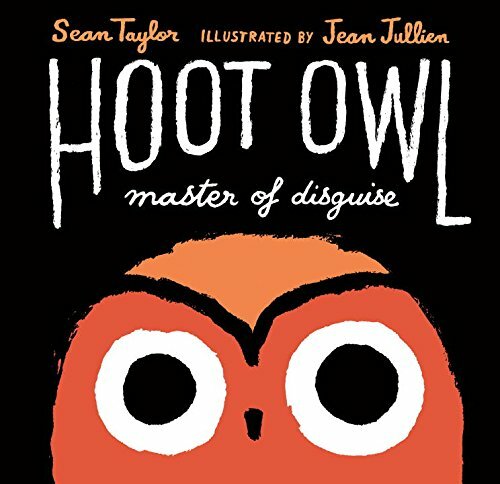 The Mini Reviewers found this story absolutely hilarious, particularly Hoot's disguises. They were incredibly relieved each time Hoot failed to catch his dinner. I could literally hear them holding their breath, waiting to see what would happen. Also the fabulously bold illustrations fit brilliantly with the drama of the story. This is a perfect picture book to share. Just have a go at reading it through a few times first to get the comic timing right! This is Steven, probably the most confident seagull you will ever see! He is a retired cop but his ex-partner, a goldfish called Mac, wants him back on the force to help clean up Beach City. Steven knows “a gull’s gotta do, what a gull’s gotta do” so joins Mac in his search for the Sand Thief. They waste no time in rounding up suspects at the beach. But will they be able to solve the mystery of the missing sand once and for all? Or will Steven’s renegade ways get the better of him? Sorry there are no spoilers here! Let’s just say that we have read this book over and over again and it never fails to make us giggle. Both the text and the almost comic book style illustrations are very funny. Give it a read, you won't be disappointed! Disclaimer: I won Hoot Owl from a Toppsta Giveaway and Steven Seagull from a competition run by OUP on Twitter. All opinions are, as always, my own. I love funny books and these both sound great. Steven Seagull Action Hero is a brilliant title. It made me smile just reading it. More to add to the grandchildren's reading list. Yes such a great title :) Hope the grandchildren enjoy it! We love owls and have several stories about them but we don't know Hoot Owl. I love the look of these! And Steven Seagull seems very popular! BookBairn is going to meet some owls on her holidays so perhaps Hoot Owl would be fun to read - though I love Owl Babies and find it hard to see past that for a perfect owl book!